Bactronix has been making headlines for several years for their revolutionary solution to killing and eliminating bacteria, germs, and odors found in busy hospitals and commercial environments. Now, their unique nanotechnology is available to everyone in an easy-to-use formula called Bactrokill! What Makes Bactrokill Unique? This new technology is far superior to past methods that attempt to kill bacteria through toxic chemical saturation. Instead, Bactrokill is a non-toxic product that physically kills dangerous microbe organisms on both hard and soft surfaces. Odors and germs are completely eliminated. Bacteria cannot buildup a resistance to Bactrokill! Why is Bactrokill Better Than Bleach for Sanitizing? Bleach has always been known to kill bacteria, but over the years, bacteria has built up an immunity to bleach in the form of what is called “biofilm”. This layer protects bacteria from being eliminated by products such as bleach. Why is Bactrokill Better Than Odor Eliminators for Smells? Many odor control products simply coat odor-causing bacteria only to have that odor resurface over time. Not to mention, these products typically have a cover-up smell that produces more VOC’s or carinogens. Bactrokill eliminates odors without produces VOC’s or carinogens and causes surfaces to be truly odor free! Where is Bactrokill Frequently Used? 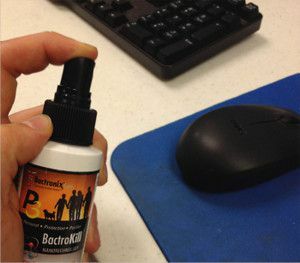 Bactrokill is recommended for many environments and the convenient travel safe size (3 oz) is great for taking on the go! Use on grocery carts, airplanes, hotel room, door knobs, remote control, public restrooms, computers, keyboards, baby car seats, toys, etc. For more information on Bactrokill please visit the Bactronix website.